If you want to find out all the details about the ingredients, the dosage, the price and the guarantee policy for Family Care Tolnaftate Antifungal Cream, then this is the review for you. 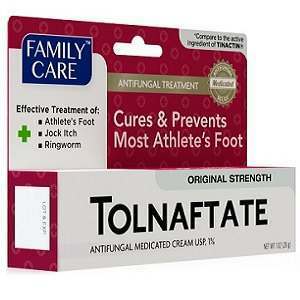 Family Care Tolnaftate Antifungal Cream is a product designed to treat and prevent different types of fungal infections, including the highly common athlete’s foot (tinea pedis), jock itch (tinea cruris) and ringworm (tinea corporis). The product has been clinically tested and proven to relieve and completely cure symptoms of fungal infections such as cracking, itching, burning and chafing. To find out more about Family Care Tolnaftate Antifungal Cream continue reading this review. The primary active ingredient, tolnaftate, which accounts for one percent of the total formula, is a synthetic anti-fungal substance designed specifically to eliminate infections such as athlete’s foot. The compound works by inhibiting the production of an enzyme that is essential for new fungal cell membranes to be created. Chlorocresol can potentially cause skin irritation or rashes due to being a moderate allergen. Family Care Tolnaftate Antifungal Cream comes with a convenient set of instructions, which can be easily accessed on the internet or found directly on the packaging. Once you have identified the infection, clean and dry the area with care and then proceed to apply a thin layer of Family Care Tolnaftate Antifungal Cream. Once this is done, gently massage it into the skin, so that the cream may clean out and sterilize the pores. When used to eliminate athlete’s foot, pay special attention to the area in between the toes and make sure to apply the cream twice a day, both morning and evening. Typically the infection should be gone within four weeks. However, if this is not the case, seek medical attention. Due to some of the ingredients being allergens, for example chlorocresol, the product may cause skin irritation, rashes or various other uncomfortable side effects. The product should be kept clear of one’s face and eyes and is not to be used on children under two year of age. A package of three tubes of Family Care Tolnaftate Antifungal Cream costs $6.21 when purchased from Amazon. If your order exceeds $35, shipping will be free. The price of this product is extremely low in relation to the market average. The reason for this is unknown as much of the ingredients are the same as in any anti-fungal cream. While there is no official guarantee policy in place enforced by the manufacturer, the customer reviews we found are positive. Despite this, the lack of a guarantee remains a negative point as paying even such a small amount is a waste if the customer is unsatisfied with the results. Family Care Tolnaftate Antifungal Cream has an unbeatable price and several positive customer reviews. However, the possibility of negative side effects coupled with the lack of a guarantee prevent us from recommending this product. Jimmy Rodriguez	reviewed Family Care Tolnaftate Antifungal Cream	on June 10th	 and gave it a rating of 2.5.